Aleppo is the largest city in Syria and serves as the capital of the Aleppo Governorate, the most populous Syrian governorate. With an official population of 2,132,100 (2004 census), it is also one of the largest cities in the Levant. For centuries, Aleppo was the Syrian region's largest city and the Ottoman Empire's third-largest, after Constantinople and Cairo. Aleppo is one of the oldest continuously inhabited cities in the world; it has been inhabited since perhaps as early as the 6th millennium BC. Excavations at Tell as-Sawda and Tell al-Ansari, just south of the old city of Aleppo, show that the area was occupied since at least the latter part of the 3rd millennium BC; and this is also when Aleppo is first mentioned in cuneiform tablets unearthed in Ebla and Mesopotamia, in which it is noted for its commercial and military proficiency. Such a long history is probably due to its being a strategic trading point midway between the Mediterranean Sea and Mesopotamia (i.e. modern Iraq). The city's significance in history has been its location at the end of the Silk Road, which passed through central Asia and Mesopotamia. When the Suez Canal was inaugurated in 1869, trade was diverted to sea and Aleppo began its slow decline. At the fall of the Ottoman Empire after World War I, Aleppo ceded its northern hinterland to modern Turkey, as well as the important railway connecting it to Mosul. Then in the 1940s it lost its main access to the sea, Antioch and Alexandretta, also to Turkey. Finally, the isolation of Syria in the past few decades further exacerbated the situation, although perhaps it is this very decline that has helped to preserve the old city of Aleppo, its medieval architecture and traditional heritage. The Great Mosque of Aleppo or the Umayyad Mosque of Aleppo is the largest and one of the oldest mosques in the city of Aleppo, Syria. 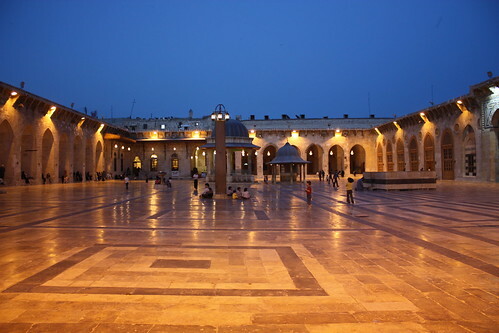 It is located in the Ancient City of Aleppo, a World Heritage Site, near the entrance to al-Madina Souq. The mosque was built in the beginning of the 8th century. However, the current building dates back to the 11th through 14th centuries. The minaret was built in 1090, and was destroyed during fighting in the Syrian civil war in April 2013. The construction of the earliest mosque was commenced by the Ummayad caliph al-Walid I in 715 and was finished by his successor Sulayman ibn Abd al-Malik in 717. In the second half of the 11th century, the Mirdasids controlled Aleppo and built a single-domed fountain in the mosque's courtyard. At the northwest corner of the mosque, the 45-meter high minaret was built by the Shia Muslim qadi ("chief Islamic judge") of Aleppo, Abu'l Hasan Muhammad in 1090, during the reign of Seljuk governor Aq Sunqur al-Hajib. Its construction was finished in 1094 during Tutush's rule. The mosque was restored and expanded by the Zengid sultan Nur al-Din in 1159 after a great fire that had destroyed the earlier Ummayad structure. In 1260 the mosque was razed by the Mongols. The Mamluks (1260–1516) made repairs and alterations. Carved Kufic and nashki inscriptions decorated the entire minaret along with alternate bands of stylized ornaments in patterns and muqarnas. Sultan Qalawun replaced the burnt out mihrab (niche indicating the qibla, or direction to Mecca) in 1285. Later, Sultan al-Nasir Muhammad (1293–1341) had the new minbar ("preacher's pulpit") constructed during his reign. The Great Mosque is built around a vast courtyard that connects to different areas of the mosque, positioned behind the colonnaded arcade. The courtyard is well known for its alternating black and white stone floor that forms intricate geometric arrangements. Two ablutions fountains, both of which are roofed. The court yard also has an open prayer estrade and a sundial. The haram ("sanctuary") consists of the main prayer hall to the courtyard's south, which contains the primary elements of the mosque: the shrine of Zechariah, a 15th-century minbar ("pulpit"), and an elaborately carved mihrab ("niche"). Although the central entrance contains an inscription attributing its construction to Ottoman sultan Murad III, it was built by the Mamluks. The hall has three naves, all lined with 18 quadrangular columns with cross-vaults. This large prayer hall originally had a basic straight rooftop with a central dome, but during Mamluk rule was replaced with an intricate cross-vaulted system with arches and a small dome over the arcades. The mihrab is deep and round and Zechariah's supposed tomb is to its left along the southern wall. There are three other halls that abut the remaining sides of the courtyard. The eastern and northern halls each have two naves, while the western hall has one. The latter is mostly of modern construction. The east hall dates to the period of Malik Shah (1072–92) and the north hall was renovated during Mamluk sultan Barquq's reign (1382–1399), but largely maintained its original 11th century character. The minaret's shaft, which protruded out of the flat roof of one of the halls, consisted of five levels with a crowning top encircled with a veranda. A muqarnas-style cornice divided the veranda top from the shaft. The structure was largely built of fine ashlar. The minaret was heavily decorated in relief ornament, more so than any other Islamic-era structure in Aleppo with the exception of the Shu'aybiyah Madrasa. Its stories contained cusped arches and continuous mouldings. The masonry of the minaret varied throughout, with a mix of light and heavy usage of toothed tools, short, long, vertical and horizontal strokes, fine and rough finishes, and small and large stones.